Born on May 3, 1938, in Oakland, California, Christopher John Cannizzaro was raised in the neighboring city of San Leandro. The great-grandson of Italian immigrants Angelo and Antonina Cresci Cannizzaro, Chris and his two younger brothers also possessed a strong Spanish heritage from their mother Isabelle Carabello. Their father John was a San Leandro police officer and an accomplished semipro shortstop. Chris followed in his father’s baseball footsteps until his uncle-Boys Club manager, convinced the 11-year-old was too slow for the middle infield, persuaded the youngster to move to catcher. Chris thrived behind the plate and, in high school, earned all-state honors for the San Leandro Pirates. In the summers he continued play in both American Legion and semi-pro ball and soon began attracting major-league attention. Aggressively scouted by the New York Yankees, Los Angeles Dodgers, Boston Red Sox and St. Louis Cardinals, Cannizzaro leaned strongly toward the Cards. 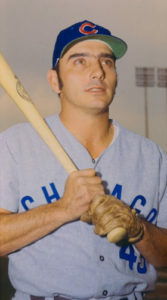 He reasoned he had a quicker path to the majors without being blocked by the likes of Yogi Berra or Roy Campanella. Shortly after his high school graduation in 1956, Cannizzaro inked with Cardinals scout and former minor-league outfielder Tony Governor for a $1,800 salary and a $2,200 bonus. Thanks for the photo Jon Simonian. 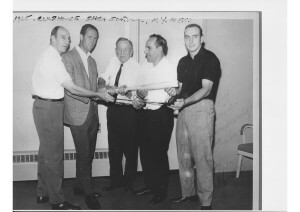 From left to right: Warren Spahn,Tony Lema, Casey Stengul, Yogi Berra, and Chris Cannizzaro – first guy from San Leandro to make Big Leagues.